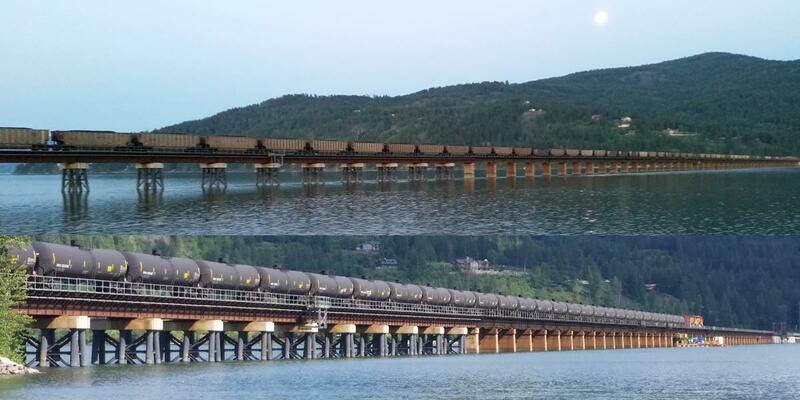 Activist groups RADAR and Wild Idaho Rising Tide (WIRT) and north Idaho residents opposing a second Burlington Northern Santa Fe (BNSF) rail bridge across Lake Pend Oreille invite community members to three rescheduled events on Thursday and Friday, June 22 and 23, in Sandpoint, Idaho. To accommodate outcomes envisioned by numerous participants converging from across the region, including indigenous activists, we have revised the times and dates of these opportunities. A few dozen local, opposition group members and visitors will share issue information and brainstorm tactics and strategies (besides the usual, regulatory hoops pushed by mainstream, green groups) close to the BNSF pile load test site. Please propose subjects for discussion, bring camp chairs, and RSVP for bike trailer transportation for participants who cannot walk to the park. The Earth First! Road Show collective crew will offer training workshops on a variety of assertive, protective, activist skills chosen by participants, for resistance to fossil fuels, climate change, and harmful infrastructure. See the following, linked, updated announcements for further logistics, and contribute potluck and donated food, if possible [1, 2]. We will disclose the event location address only to people attending, so please RSVP to WIRT. Organizers encourage fellow activists to expand camaraderie and coalitions, share ideas and concerns, and enjoy band performances at downtown pubs later on Friday night. We heartily welcome your input and involvement during as many of these upcoming activities as you can join to create change. Respond with your questions and suggestions, via the enclosed contact channels. Thanks!